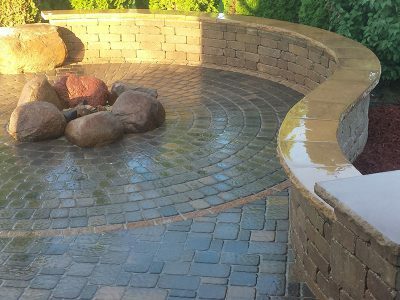 Hardscaping – Turf and Landscape Inc.
Construct a picturesque outdoor space with hardscaping. Beautiful stonework, outdoor fireplaces, trickling water features, and expertly crafted brick patios turn your yard into a place to gather—forming the heartbeat of your landscape. Our decades of experience mean we can conceptualize and install beautiful, unique architecture perfectly tailored to your property. We pride ourselves on attention to detail and correct measurements, placing every landscape stone and brick right the first time. Hardscaping is functional as well as aesthetic. Retaining walls hold dirt in place. Pathways, pavers, and steppers provide a place to walk. Seat walls give you a place to sit and enjoy the day, while a fire pit keeps you warm at night. Our unique designs and professional construction enhance your property by complementing your home and landscaping. Turn your lawn into a living space with hardscaping from Turf & Landscape Inc.